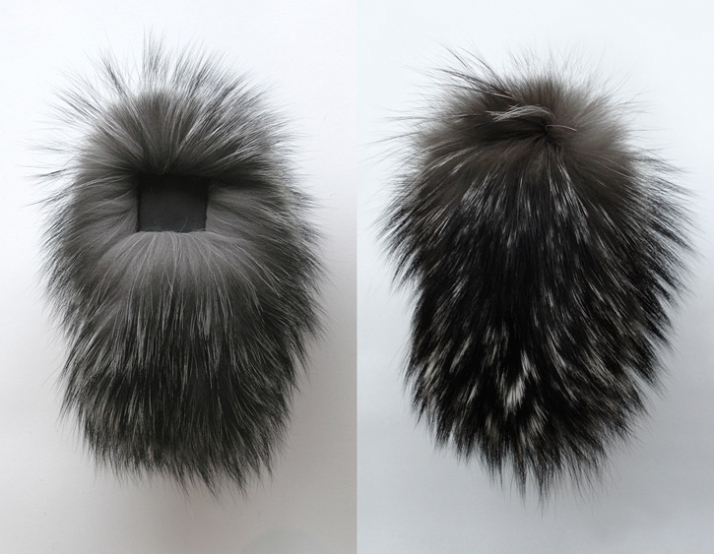 Designer Magnhild Disington’s experimental work Furry Object was among the finalists for this year’s competition “The Golden Fur Needle” held by Kopenhagen Fur. 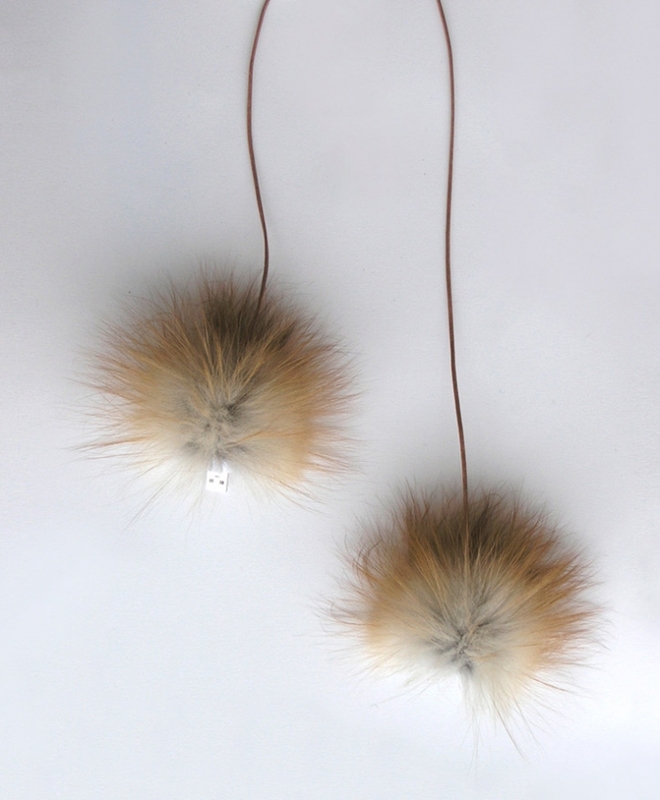 Furry Object 2.0 and Furry Object 2.1 were selected for the industrial design category, as they possess fur elements combined with portable electronics. Currently residing in Denmark with a Master’s degree in textile design from Kolding School of Design, Disington proclaims her personal creative process as experimentation with aesthetics and tactility in order to craft a “story”, if you will. These new entities are constructed with both chaos and carefulness, using a wide range of tools, from photography to raw materials that have been ripped apart then put back together. 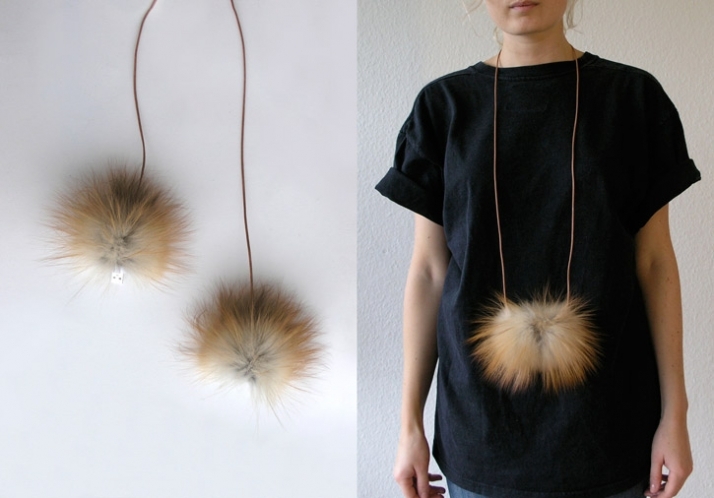 Furry Object 2.0 or, The Modern Amulet, is a more practical collection of USB flash drives and explores the mostly forgotten relationship between humans and their portable electronics. Often unemotional and lackluster in style, technology is such a major part of our daily lives yet has such an impersonal and commonly look. Says Disington, “With The Modern Amulet I have tried to balance the emotional value between the information we carry and the objects we use to carry them”. 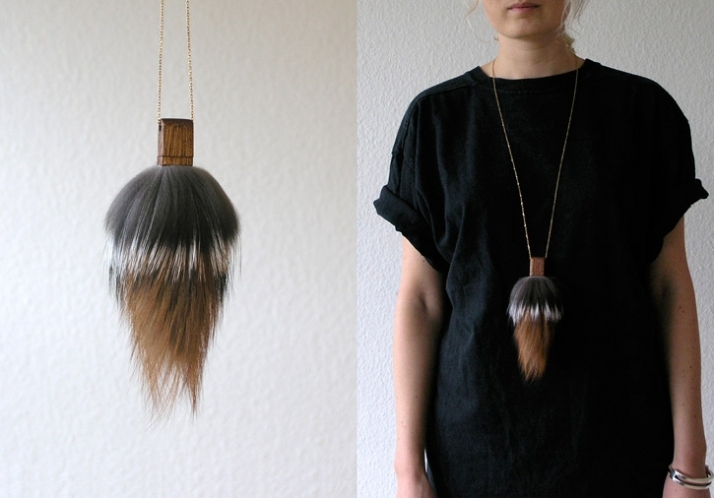 Where The Modern Amulet is a more sensible product, Furry Object 2.1, or Future Connections, has a more avant-garde, innovative attitude. Forcefully questioning why electronics look as neutral and boring as they do, Disington asks: “Why?”. 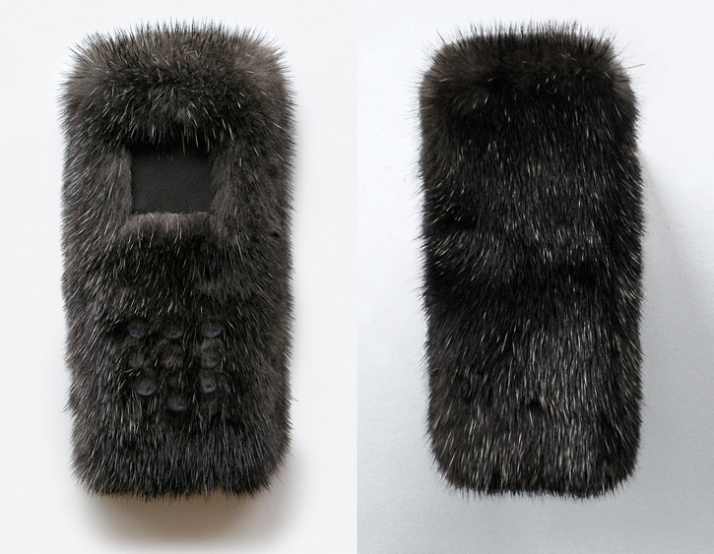 The furry mobile phone cases offer, at least, a hopeful glimpse into the future of portable electronic design and the personalization they can create. Portable electronics are often neutral in appearance and lack emotional appeal. They have become a more pervasive part of our lifestyle and are things we carry with us most of the time. People tend not to feel any connection with them and change them gladly as soon as something better and newer is on the market; there is an abnormal refreshment rate for these types of product. Do we really need a new phone every six months? It is my belief that the values within our digital interactions outweigh the value of the electronic devices we use to make them. If we put more thought into the materials we use we can create a stronger emotional connection to these object and we might hold on to them a little longer as keepsakes. 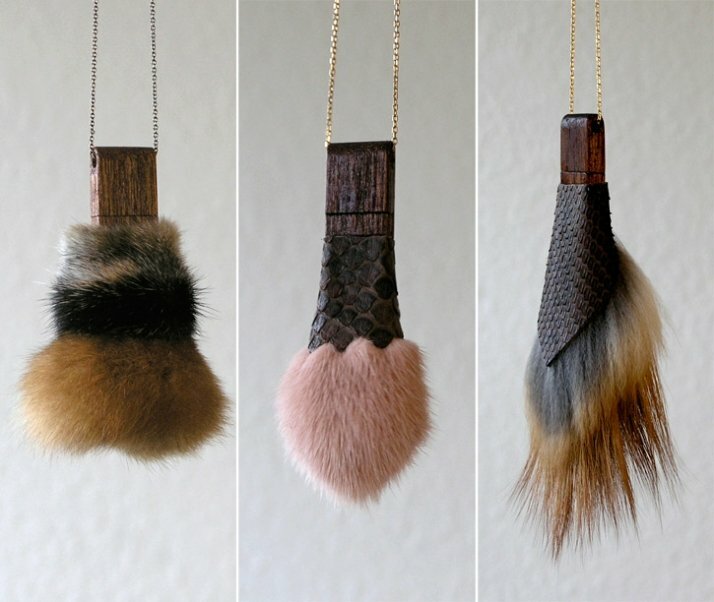 For the collection of USB keys (flash drives) I have applied natural materials like wood, leather and fur. These materials provide unique character and sensory experiences which create emotional value within the physical product. This creates a more balanced connection between ‘content of desire’ (our files and interactions) and ‘object of desire’ (our electronic devices). Because of their minimal size the usb keys are ideal for being made out of left over material, that other way would go to waste. 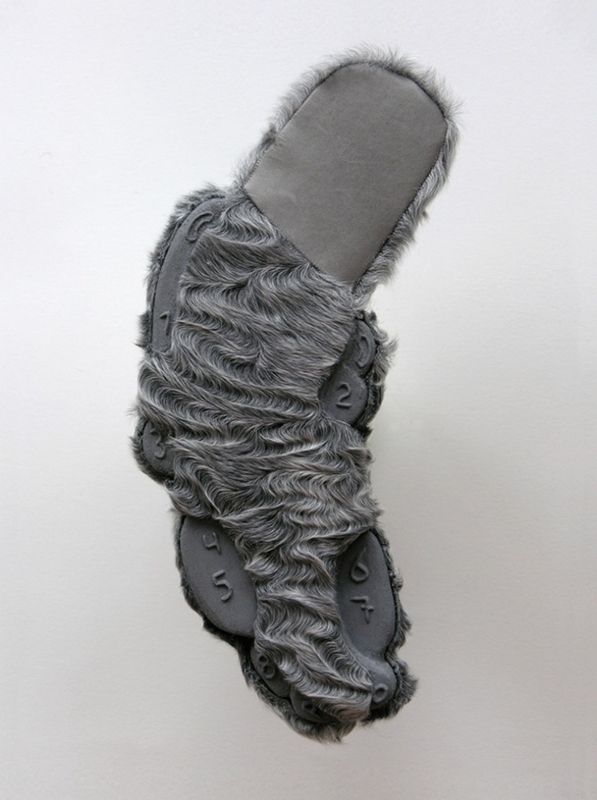 And my collection would be an ideal supplement to any company that already works with fur and leather. Working with fur could in some parts be controversial. But the way I feel is as long as the fur comes from farms with restrictions and good conditions it is one of the most sustainable fabrics you can get. A natural material with a long history. 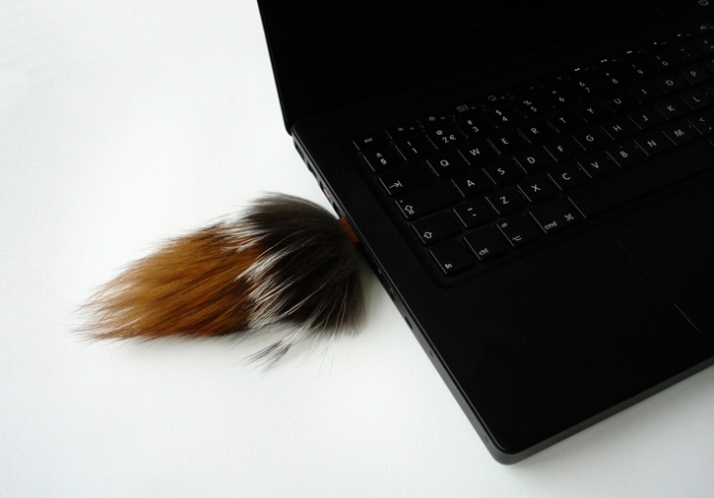 Where the usb keys are easy to implement right now, the furry mobile phones are made as inspirational materials. Their purpose are as eye-openers, to push the boundaries of the category codes dominating today’s market. Something that intrigues me is to create objects and materials that span from beautiful and subtle to the shocking and grotesque. I find the more sophisticated look in the contrast between beauty and a more peculiar expression. But most importantly I want the work I create to reflect this contrast, to evoke thought and opinion.